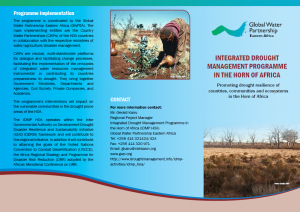 The Integrated Drought Management Programme (IDMP) in the Horn of Africa promotes drought resilience of countries, communities and ecosystems in the region. It is part of the global IDMP programme that the Global Water Partnership (GWP) and the World Meteorological Organisation (WMO) launched in Geneva in March 2013 at the High-level Meeting on National Drought Policy (HMNDP). A key element from the meeting is to support stakeholders at all levels by providing policy and management guidance and by sharing scientific information, knowledge and best practices for Integrated Drought Management. Overall, the IDMP HOA will build climate resilience, reduce economic and social losses, and alleviate poverty in drought-affected regions within the HOA through an integrated approach to drought. Specifically, the program will operate in Djibouti, Eritrea, Ethiopia, Kenya, Somalia, South Sudan, Sudan and Uganda. The Horn of Africa has experienced adverse weather effects for a long time. A shortfall in precipitation levels over extended periods of time and a decline of water resources affect society, economies and ecosystem, in some cases causing severe humanitarian consequences. Over 13 million people have been affected by drought with at least 30% malnourished in the drought affected areas of the HOA. Moreover, countries in the HOA lack the technical measures, institutional and policy aspects of integrated water resources management approaches in drought prone areas to address the challenges. Previous efforts of managing drought in the HOA focused on emergency/crisis response such as providing relief to the victims rather than its integrated management focusing on preparedness and drought mitigation and early warning. Holistic and interdisciplinary approaches that go beyond alleviating short-term suffering and stress are necessary to address the challenges associated with drought. Therefore, the programme will facilitate collaborative and integrated approaches to achieve sustainable management of water and drought in the drought prone areas of the HOA. IDMP HOA will focus on enhancing strong partnership and strengthening capacities with the overall aim of developing resilience to drought and climate change in the HOA following an Integrated Water Resource Management (IWRM) approach. Its particular contribution will be to strengthen partnership and influence policy and practice towards more integrated management of drought in the HOA in a changing climate. The programme will contribute to the implementation of United Nations Convention to Combat Desertification (UNCCD), the Africa Regional Strategy and programme for Disaster Risk Reduction (DRR) adopted by the African Ministerial Conference on DRR, and Inter Governmental Authority on Development (IGAD) Drought Disaster Resilience and Sustainability Initiative (IDDRSI). It will also contribute to the implementation of the recommendations of IGAD and East African Community (EAC) Summit. The programme is implemented in support of the Water, Climate and Development (WACDEP) programme of the AMCOW/African Union. The overall objective of the programme is to promote drought resilience of communities in the HOA. This will be through shift from reactive, crisis management response to a more proactive approach to drought management, applying the principles of integrated water resource and risk management. At the regional level, the 3 year programme is coordinated by the Global Water Partnership Eastern Africa (GWPEA), in collaboration with other partners. The main implementing entities will be the Country Water Partnerships (CWPs) of the HOA countries in collaboration with the respective ministries of water/agriculture/disaster management. CWPs provide a multi-stakeholder platform for dialogue and facilitating change processes and will be instrumental in contributing to their countries preparedness to drought. They include government ministries and agencies comprising those charged with the responsibility of implementing drought policies; NGOs, private companies, the academia working on research and knowledge dissemination etc. The primary beneficiaries of the Programme are the vulnerable communities in the drought prone areas of the HOA. Find out more about the Regional IDMP for the Horn of Africa (IDMP HOA).